Dog Flu outbreaks are occurring in all 50 states. Also known as Canine influenza this disease is caused by different varieties of influenza virus A. 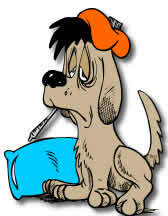 Often the newer types of influenza may be confused with kennel cough. In high traffic areas, such as examination rooms, dog show preparation areas or grooming stations, it is important to minimize the opportunities for exposure to dog flu. ProVetLogic’s Animal Facility is available in concentrated formulas for large applications and in ready-to-use spray bottles for convenient home and clinic use. Conscientious use of this product can have significant results in preventing the spread of dog flu. For details on the efficacy of these products, see the PDF files containing details.